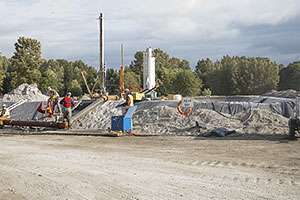 McCue was retained to develop a water treatment solution to remove sediment and dissolved metals from excavation water prior to discharge into a river at flow rates exceeding 2500 GPM. McCue completed the detailed design and installation of a multi-chambered treatment lagoon consisting of aeration, flocculation, and settling chambers which incorporated an abandoned tailings pond already onsite. The lagoon met the client’s requirements at a fraction of the cost of standard water treatment equipment.